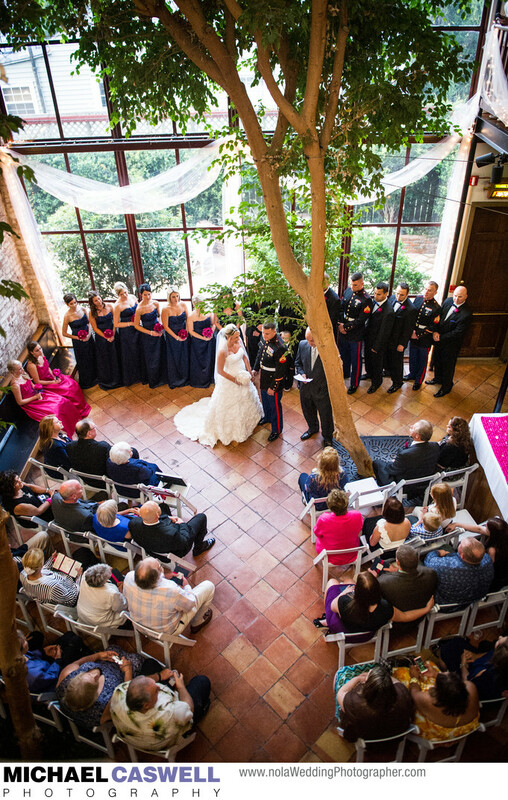 This military couple's wedding ceremony was held in the beautiful atrium of historic Rosy's Jazz Hall in New Orleans. Located uptown just off Tchoupitoulas Street and known for its great food and unique atmosphere, Rosy's is a favorite venue among brides in this area seeking something a bit different. Rosy's also features a large stage in the main reception area, which makes it a great choice if you'll be having a large band provide the entertainment at your wedding. This historic building dates back to the mid-1850s and has served numerous functions, including as a jazz club in the 1970s, Steve, the owner, takes great pride in the delicious and elegantly-presented food Rosy's is known for, and coordinator Darlene ensures your event goes smoothly. Location: 500 Valence St, New Orleans, LA 70115.